Observation - Chiffchaff? - UK and Ireland. Description: Not sure if chiffchaff or willow warbler. Shape looked more like chiffchaff but book says legs should be dark and they don't look that dark when I zoom in. Not sure if chiffchaff or willow warbler. 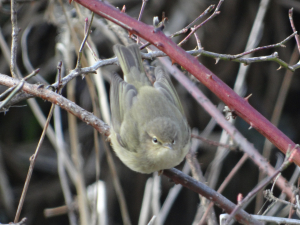 Shape looked more like chiffchaff but book says legs should be dark and they don't look that dark when I zoom in.